Signing up with the local dive shop for three days of diving off of Key Largo, our primary, 21st Century concern in the week before the trip is the All-American worry: "What time should we drive there and back to avoid the horrifying agony of Labor Day weekend gridlock? Fortunately, one of the divers who has signed up agrees to drive us down, and his early Friday departure sounds like an effective traffic-congestion avoidance plan. It turns out that he is right, as we arrive at our Bayside Hotel a number of hours before we had anticipated. We have time for a leisurely Friday lunch, and serendipitously stumble upon a virtually next-door home-cooked-meals restaurant with a packed parking lot (a reliable indicator of quality). Mrs. Mac's Kitchen oozes with authentic ambience and local character. The quality of the food is magnificent, which readily explains why it is regularly populated by "the locals." Over the course of the weekend, we find ourselves as repeat customers at Mrs. Mac's, and agree we will return in the future, should we again be passing through Key Largo. We awake the next morning and caravan to the marina, where Christal Clear will be our dive operators. The Christal Clear dive boat is brand new, and we are all impressed by the design features - which show that the boat builders knew of the needs of divers. Our boat captain, George, with 20 years of experience in the Keys, is a treasure trove of dive information, and each day is able to navigate us to the best dive sites. Captain George has a full reckoning of weather, water, and reef conditions. Our two-tank dive on Saturday morning features North Star on Molasses Reef and Sand Bottom on French Reef. Our shallow-water excursions find us swimming amongst schools of parrot fish and angel fish. 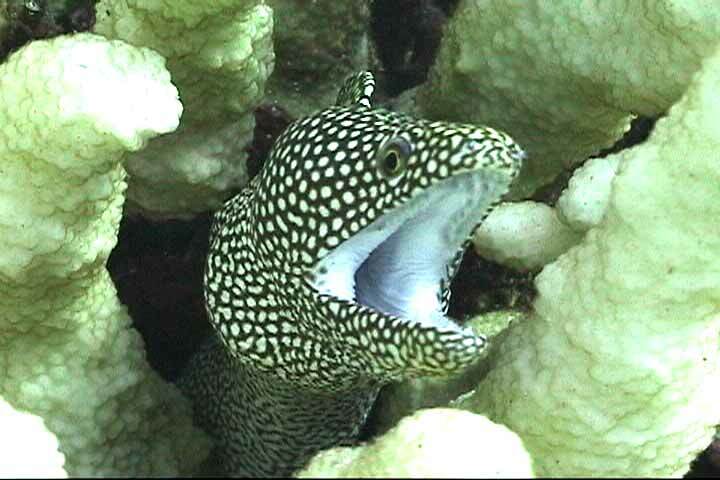 Large, green, menacing Moray eel chomp at us from their coral reef crevasses, and lobster peer at us from under reef ledges. We spot a good-sized nurse shark leisurely swimming with us, as well as a black sting ray. 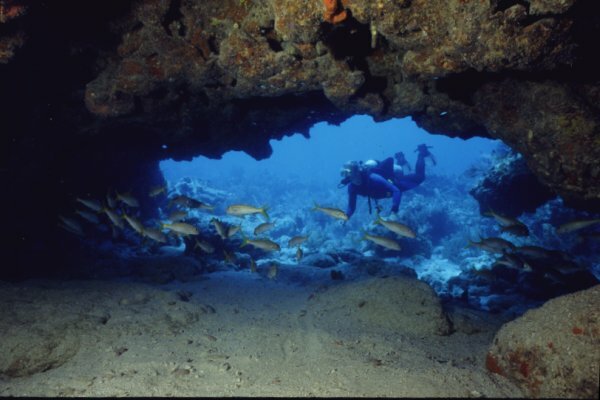 North Star contains impressive canyon reefs, while Sand Bottom provides delightful, tight-fitting coral swim-throughs. Our next dive trip is not scheduled until the next afternoon, so we have plenty of time to sleep late and luxuriously enjoy a Sunday brunch. Today, our first reef is Snapper. As it's namesake indicates, Snapper Reef features colossally thick, seemingly endless schools of bright yellow snapper. I feel as if I am floating in a yellow cloud as hundreds of snapper surround me. This reef seems to explode with an enormous diversity of marine life. Our group gets dizzy as members repeatedly call others to see the latest "find" in all directions. Spotted eel, Moray eel, nurse shark, small rays, flounder, and the most gargantuan brain coral I have ever seen (about the size of a Volkswagen Beetle). Our second dive is Pickles, a place we find rather unremarkable. The final Sunday dive is a night dive on the Wreck of the Benwood. Here we find gigantic parrotfish, lobster, and large crab. The large World War II ship appears ghostly at night as we use our flashlights to illuminate its hulk on the ocean bottom. The marquee dive is our first Monday morning dive. The world-famous Spiegel Grove wreck. 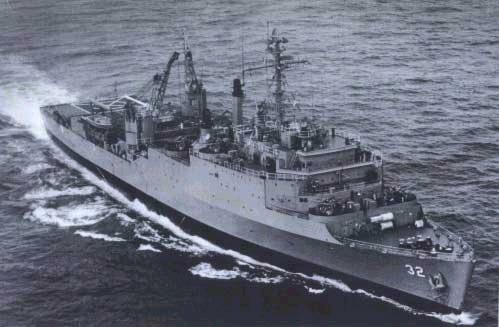 The Spiegel was commissioned in 1956 and served as a US Navy Landing Ship Dock. The ship was named after the Ohio estate of US President Rutherford B. Hayes. The ship saw action throughout the Caribbean Sea, the United States East Coast, Africa, the Mediterranean Sea, Panama and the Middle East, including an important role in the original Operation Desert Storm in the Persian Gulf. She carried a crew of 18 officers, 325 men and 318 troops. Spiegel was decommissioned in 1989. The ship had spent 12 years tethered in the Navy's "Mothball Fleet" in Virginia's James River. The sinking in 2002 was somewhat of a fiasco. First, the ship sinks before it is planned to. In June 2002, only a few hours from the scheduled scuttling, the hull began taking on water, the ship turned upside down, and started to sink prematurely hours before volunteers were going to scuttle it. The volunteers fled the ship for safety. Equipment worth thousands of dollars were dumped to the ocean floor. Professional ship salvers were called in to finish sinking the ship, which by then was floating upside down with part of its hull exposed. Ultimately, the 6,880-ton Spiegel ended up resting on its side at the sandy ocean bottom. Fortunately, Hurricane Dennis ("Dennis the Menace") uprights the ship in the summer of 2005. Today, it rests at a sandy bottom130 feet below, and because of its 90 feet of height, rises to within 50 feet of the ocean surface. The ship is about six miles off of Key Largo. At the time of its sinking, the Spiegel Grove was the largest ship ever intentionally sunk to create a new reef for divers. The Duane and the Bibb, two decommissioned U.S. Coast Guard cutters, rest nearby off Molasses Reef in slightly deeper water. 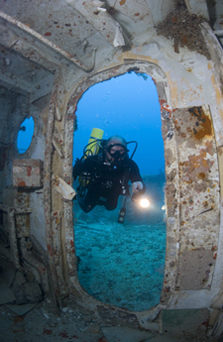 However, those wrecks are only accessible to experienced divers. We anchor at the wreck and the captain regretfully informs us that there is a very strong current today. My wife opts to sit out the dive. 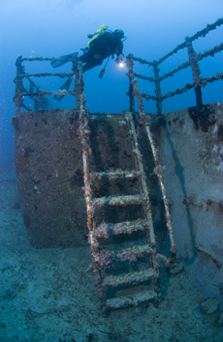 I find a new dive buddy and we descend, hand over hand, along the rope tied to the wreck below. With the unnervingly stiff current, I am careful not to lose my grip on the safety rope. Who knows where I would end up (Cuba?) if the current ripped me from the guideline. Behind us, the trip leader is training an Advanced Certification class, but soon after he gets in the water, his mask is blown off by the raging current and he quickly calls off the dive. Fortunately, I have already descended to the ship. We reach the MASSIVE Speigel wreck at about 65 feet. Before us is a ship too large to see its full length, even from a distance. It is, after all, 510 feet in length, which is almost two football fields long (and 85 feet wide). The ship is so large that we are only able to inspect a tiny fraction of the ship during our dive, even though we are diving nitrox. A number of doorways and hatches enable reasonably safe ship pass-throughs, and we swim through a few of these. I feel like a tiny mosquito dwarfed by a large elephant I have landed on. 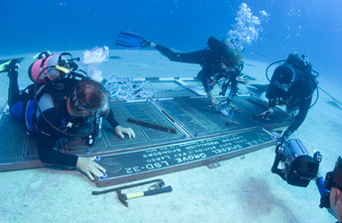 Near the end of the dive, my buddy points to a name on a metal plaque (see photo below) placed on the side of the ship. It is his name, as he was involved in the sinking in 2002. Our final dive is at the Christmas Tree site on French Reef. Here, one finds healthy reefs, colorful marine life, and excellent swim-throughs. One of these finds me passing through a 25-foot long slot filled with a school of silver fish. Overall, a very enjoyable dive site. In general, our visibility is somewhat mediocre. But the quality of our dives, and what is in store for us in diverse marine life and impressive shipwrecks, more than compensates.